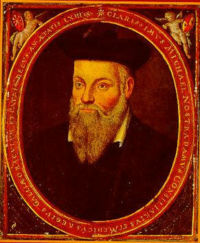 The Peru meteorite crash was the awaited sign of the advent of Nostradamus’ third anti Christ. Learn his real name. A wise woman once said, “He who knows everything knows nothing.” 2 billion Christians, 1 billion Muslims and 18 million Jews believe that their Holy Bibles, including the books of the Prophets are the word of God of Mount Sinai, but if you told any one of them that you were a Prophet, they would put you into a mental institution. This is because the human mind thinks that time is linear and “How can an angel tell the future to a person if the event hasn’t happened yet? It’s impossible.” In order for prophecy to exist the future must have already happened and any psychiatrist will tell you that this is impossible. Apparently no one mentioned this to Nostradamus in the 1500’s. So far Nostradamus has correctly predicted the first anti Christ Napoleon Bonaparte and the second anti Christ Adolf Hitler. According to Nostradamus the third and final anti Christ will be named something like “Mabus”. Open your mind. When the mind hears something which seems like absolute baloney it shuts off and doesn’t listen. The way to open your mind is to say to yourself when the person is talking to you, “This is right, this is true”, over and over. Because Nostradamus predicted in code the coming of “Napaulon Roy” and “Hister” hundreds of years after his death, time cannot be linear. The future must already have happened in order for a spirit to tell Nostradamus the future. One way to understand this is to picture time as an infinity symbol, or an hourglass or the number “8” laid on its side. It’s like trying to find “Waldo” or “Nemo”. On May Day, May 1, 2007, the day of the celebration of the Virgin Mary, The Temple of Love – The World Peace Religion announced that Nostradamus’ third anti Christ was the ultra hard line daily advisor and puppet master of the President of Iran, Iranian Ayatollah Mesbah (pronounced Maybah, like Nostradamus’ Mabus, like Hister is to Hitler) Yazdi. Iranian Ayatollah Mesbah Yazdi’s declared intention is to follow the word of God of Mount Sinai as told to the angel Gabriel and then to the Prophet Muhammad (PBUH) outlined in the Koran and the Hadith and “Make War on the Christians, Jews and infidels and be rewarded with eternal paradise in Heaven with God of Mount Sinai, crystal clean lakes and springs, endless wine with no side effects, 72 virgins and 80,000 servants per martyr and believer.” (Koran Sura Chapter 9:5, 29-30 and Chapter 56, “Mecca”). Could you throw in a dozen bagels mit cream cheese? Imagine some Bedouin in the Arabian desert today telling his friends that an angel had just told him that if they converted to his new religion and killed all of the Albanians that God would give them all hot tubs. How many followers would he have, other than Tom Cruise and John Travolta? Nostradamus’ third anti Christ Ayatollah Mesbah Yazdi declared that using nuclear bombs is perfectly fine according to Muslim law in order to conquer the world for God of Mount Sinai aka Allah, God the Father, Jesus Christ, The Holy Spirit, Elohim, Yehovah, Adonai. He believes that by triggering the Apocalypse it will bring about the advent of the two Muslim messiahs Jesus Christ and the Mahdi, to conquer the world for Islam and bring everlasting world peace. Every nuclear scientist knows that nuclear world war 3 and its aftermath nuclear winter then ultraviolet summer will have no survivors and Nostradmus’ third anti Christ thinks that by triggering nuclear world war 3 the Muslims will survive and own the world. Thanks to George Bush’s attempt to conquer the Middle East’s oil, and conquer the world for Christianity, if the United States were to leave Iraq now, two thirds of the world’s oil would fall into the hands of Nostradamus’ Third Anti Christ. With this money, the Anti Christ would have no problem purchasing more nuclear reactors from Russia like the one in Bushehr, Iran, and shiploads of nuclear weapons from North Korea. He could pay every Shiite huge salaries to conquer Saudi Arabia and the Gulf States. An even worse scenario for the United States would be if all of the Muslim countries united and turned on the United States. “Mabus will soon die, then will come, a horrible undoing of people and animals, At once one will see vengeance, one hundred powers, thirst, famine, when the comet will pass.” (Century 2, Quatrain 62) “The anti-Christ very soon annihilates the three, twenty-seven years his war will last. The unbelievers are dead, captive, exiled; with blood, human bodies, water and red hail covering the earth.” (Century 8, Quatrain 77). Do you feel like you are having flashbacks from a bad acid trip with threats of being bombarded by the media with years more of Bill and Hillary Clinton in the White House and O.J. Simpson dominating the news? George Bush is trying to trigger the Apocalypse and capture the world for Christianity so that he can meet Jesus Christ in Jerusalem – talk about social climbers. How could 3 billion people be so brainwashed that they believe that nuclear world war 3 is the road to everlasting peace on earth when every scientist knows that it’s the road to the extinction of life on earth forever? The question is not “Did we evolve?” but “Will we evolve into a peaceful species to adapt to our change in circumstances, 50,000 100 megaton nuclear bombs on earth today?” The two at Hiroshima and Nagasaki were firecrackers, 50 kilotons. Think kilobytes versus megabytes. The world is about to blow up and everyone is frantic over their SERP. On Saturday night a meteorite crashed into Peru next to Lake Titicaca with an orange streak and a loud bang. The hole filled with water and is giving off smelly noxious odours which are causing the villagers of Carancas, Peru to suffer from nausea and headaches. So far there has been no sighting of Superman. WWI was triggered by one bullet in Yugoslovia, the shot heard round the world starring Paris Hilton and Tom Cruise. The new President of France is the new Tony Blair. This week his foreign minister, like every American presidential candidate spoke of nuking Iran, Nostradamus’ third anti Christ. Russia, which has been speaking about aiming their nuclear missiles at Europe because of George Bush’s nuclear tipped cruise missiles in the Czech Republic and Poland, today warned the United States not to attack Iran. China also warned George Bush not to attack Iran. Iran is the backyard of Russia and China. We are all pawns in a high stakes poker game with two thirds of the world’s oil up for grabs. When the United States hits Iran, and all Hell breaks loose in the Middle East, Russia and China will unite as they did in beating the United States in Vietnam, and Russia and China will grab all of the Middle East’s oil. In order to do this Russia will shoot thousands of their new zig zagging 100 megaton nuclear rockets, which separate into 8 nuclear missiles in midair over the North Pole and take out the United States of America. Before the Apocalypse happens however, the Christian people of America and the Muslim world which also follows both the Old and the New Testament are entitled to know, as does every Bible Scholar on earth today, that the New Testament was first written in Greek by Greeks, the snake goat lion Beast, Devil, Anti Christ of Revelations is a plagiarism of the mythical Greek Chimera, and Jesus of Revelations flying down from Heaven on his flying horse to slay the anti Christ is a plagiarism of the Greek Myth of Prince Bellerophon on his flying horse Pegasus slaying the Chimera. Human beings are now triggering nuclear WWIII, the Apocalypse, to bring about the arrival of ancient Greek cartoon characters like Elmo to save the world for them. All human beings have to do to bring everlasting world peace to earth is for 200 people at the United Nations to agree today to permanently stop fighting. It’s that simple. It’s called evolution.